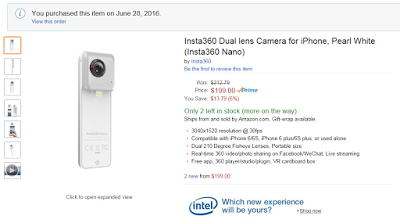 Insta360 Nano almost sold out at Amazon! The Insta360 Nano (previewed here), a 360-degree camera for the iPhone, appears to be selling pretty well on Amazon, even before it has become generally available (today is the first day it’s shipping). Apparently, there are only 2 left in stock! TBH, I’m not that surprised – the concept seems to work, and it has innovative features such as livestreaming. It doesn’t hurt that it’s competitively priced. Of course, I don’t know yet how it performs in the real world, although the photo and video samples have been encouraging. Anyway, I’m supposed to receive my order today (not a review copy). Will post first impressions ASAP. If you’d like to order one, pls. consider using this link to support 360rumors at no additional cost to you!